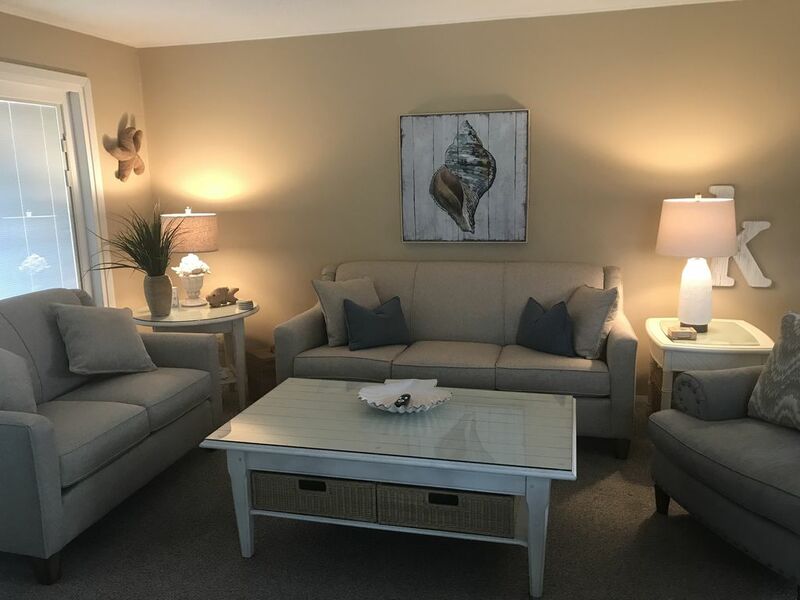 FIRST FLOOR 2 bedroom 2 full bath condo is located in Sandpiper Cove Complex, a gated community with 43 landscaped acres in the heart of Destin. We are located on the GOLF COURSE by the heated pool. The 6th hole of the course is just next to our deck, see picture. Free par 3 golf, anytime you want to play! New sliding glass doors open to both decks. Recently redecorated with new flat screen Smart TV, furniture, artwork, remodeled kitchen with new stove, new cutlery, kitchen accessories, pans and all the small appliances you will need. WiFi available in unit and on Smart TV, watch your Hulu or Netflix right in the condo, check Facebook, surf the net! Charcoal grills located at the pool next to our unit ~ yours to use anytime! Please email us from this site to ask about our specials and to inquire about last minute deals! Amenities include 1100 feet of beach with seasonal beach service and beachfront bar & grill, 5 swimming pools, 3 outdoor hot tubs, FREE 9 hole/par 3 golf course, 3 putting greens, 6 tennis courts, a canal with docs, 20 slip marina and a boat ramp, fine dining at Louisiana Lagniappe Restaurant located on the property. All of these are available to you as our guest! This condo features an in-room laundry, complete kitchen, and linens. Pets are not allowed, No Smoking. A par 3 golf course is located throughout the property. We are on the 6th green, see photo below for view from our deck. This is your ideal vacation location! Comfortable porch swing on the back deck. Our family laughing and playing at the beach. Beach service available by the day or week, prices often are negotiable. Full service beach bar & grill serves excellent burgers, chicken sandwiches, fries, fruit and much more ~ full service bar! Destin is the best - We love the area and know you will also! White sand & beautiful emerald green water. Very relaxing, friendly, and very safe & secure! Programmable thermostat - always comfortable! More towels than you need! In condo, throw in your laundry and head to the beach! With ice maker and abundant ice trays to keep all your cooler full! 5 pools to pick from - one right at our door! Great place to stay. Neighborhood is fun to walk around in and the beach is very close. Highly recommend and will be back next year. My husband and I stayed for a week at this condo and it was so amazing and relaxing! Loved having a pool right outside the door and being right on the 3 par golf course. My husband played everyday. The service of the staff was excellent as well. We will be going back again! My family and I had a great time during our stay at your condo. It had everything we needed for a wonderful vacation. Thank you so much for the wonderful memories we made there. I would highly recommend this condo. It has a beautiful view of the 6-hole from the deck and just steps away to the pool from the front door. We had 5 people staying here and it never felt crowded. It was easy access to the beach, to nearby restaurants, and other attractions. The owner gave us very detailed instructions/directions which made our arrival/departure very easy. The condo had everything we needed except for measuring cups and not enough spoons which was very minor. I ranked this a 5-star place. Thank you owners for our relaxing stay in Destin, FL.